A Ugandan scientist has developed a rapid diagnostic test that can detect Ebola proteins in less than five minutes at the point of care in the community. This is the first rapid diagnostic test that is able to detect various strains of the Ebola and Marburg viruses. In 2013 and 2014, Misaki Wayengera applied for a patent with the African Regional Intellectual Property Organisation and the World Intellectual Property Organisation. Patents are granted to inventors to give them exclusive rights to make, use and sell their inventions. On average it takes about one year for a patent to be awarded by the World Intellectual Property Organisation and five years for it to be awarded by the African Regional Intellectual Property Organisation. During this time, the inventor is expected to further develop the product and explore ways in which the product can be delivered to the market. If the patent is awarded, anyone wanting to use or sell this rapid test will need to seek Wayengera’s permission in order to do so. Uganda will take credit as the home country of the scientist behind the innovation but Wayengera’s journey to discovering the rapid diagnostic test has been a difficult one. 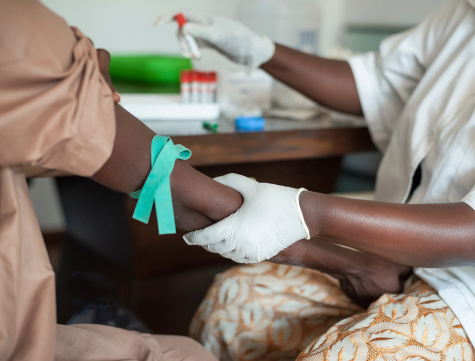 It has been characterised by a desperate lack of government funding and support—although Uganda has been in dire need of a rapid test for Ebola. Wayengera’s troubles underscore the plight faced by many young researchers in Africa—missed opportunities and a lack of political commitment towards innovation, research and development. Between 2000 and 2001, Uganda had an Ebola outbreak in three of its districts. At the time, it was considered the largest outbreak on record, infecting more than 425 people. The mortality and morbidity rates of this outbreak have since been dwarfed by the more recent outbreak in West Africa, where more than 10,000 people have died. It has always been known that containing an Ebola outbreak is not possible unless cases are picked up rapidly, but progress in the invention of effective point-of-care rapid diagnostic tests has been sluggish, at least until the outbreak in West Africa. Wayengera has been researching this point-of-care rapid diagnostic test since 2008. In his hunt for funds, he wrote a letter to the president’s office requesting financial support. He did not receive any response for two years. When he finally received one, the president’s office acknowledged the importance of his research for biodefence and pledged full support. However, his subsequent requests for funding went unanswered. Undeterred, Wayengera then turned to Grand Challenges Canada, an entity funded by the Canadian government. In 2013 he was awarded a grant of CAN$100,000. Grand Challenges Canada was willing to give him an extra CAN$1 million for his research if there was a financial commitment—of any value—from his home government. Subsequent efforts to secure local funding from the Ugandan government through follow-up letters and social media pressure were unsuccessful. In a rare turn of events, and a show of trust in his venture, Grand Challenges Canada offered Wayengera and his research team CAN$1.5 million. It was possibly due to the devastating Ebola outbreak in West Africa and beyond. The grant allowed Wayengera and his team to continue with their research, which led to a breakthrough. Innovation can boost economic growth. But it is also equally important for developing countries to support innovative developments of health products that are relevant to the local context. Low-income countries have to take increasing responsibility for their own health financing, including investing in innovation and intellectual property. Innovations are more likely to be taken up when there is a window of opportunity. This does not appear to be the case in Uganda. The Ugandan government claims to be committed to science and innovation, demonstrating this by sponsoring science students over arts university students. Of late, it has been encouraging citizens to be patriotic. It wants citizens to assist in steering national development through a proposed patriotism bill yet to be discussed by the parliament. However, had the Ugandan government given funding to this young scientist in time, Uganda—and the world—would probably have benefited from a rapid diagnostic test for Ebola when the disease hit West Africa. It is unclear why a government that is allegedly pro-patriotism, pro-science and pro-innovation, and governing a country that has repeatedly been struck by haemorrhagic fevers was not able to invest a single dime in an Ebola rapid diagnostic test. How can this be avoided in the future? If the Ugandan government is to be true to its own rhetoric, innovations for health and development must be placed high on the priority-setting agenda during resource allocation. There ought to be local funds for research and innovation in order to motivate homegrown scientists. This article is based on a blog for International Health Policies.